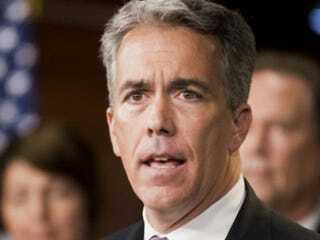 MSNBC host Martin Bashir confronted Illinois Republican Rep. Joe Walsh over his outstanding child-support payments, the Raw Story reports. The Tea Party Republican, who once said that President Obama was elected only because he was black, owes $117,437 in child support. Walsh, who has also criticized Obama in the past for overspending, once said that he would not allow the president to "place one more dollar of debt upon the backs of my kids and grandkids." Bashir responded by pointing out the Republican's hypocrisy when it came to debt and children. "You've repeatedly said over the last two years in your opposition to the president, when he's even suggested raising a surtax of 0.5 percent to enable the American Jobs Act to be paid for, that 0.5 percent levied against people earning more than a million dollars, you've opposed that," Bashir noted during the interview. "And one of the things that you have repeatedly said is that you will not place another dollar on the back of your children. "Haven't you already done that by inadequately paying child support?" Bashir wondered. "That is a question viewers have asked me. They'd like to know why you still owe $117,437 in child support." "Hey, Martin, I don't," Walsh replied. "And I'm fighting this issue — as I have gone around my district telling everyone — legally and privately. I don't and I'm going to fight it, but this is not an issue I'm going to bring up, my kids or even my ex-wife on TV. "If the election between Mitt Romney and the president, or Newt Gingrich and the president, resorts to these types of personal attacks by both sides, the country as a whole will lose," Walsh complained. Bashir and Walsh continued their back-and-forth, ending with the host saying Walsh "lacks a level of integrity." Some Republicans sure do live in a glass house that no amount of stones could break. For Walsh to harp on President Obama's supposedly irresponsible financial habits while he's being, by all accounts, a "deadbeat dad" is ludicrous. He's not exactly a stellar representative of the party of "family values," either.